Ohio Fever – a community based travel team for those kids who are looking for an elevated level of play. This level is best described as a higher level of competition than recreational softball, however not as competitive as the elite skill level found in weekend tournament softball. It will be the organization’s goal to roster as many appropriately talented Stow players as possible – as evaluated by the approved head coach and Stow YES Board. Many players and even coaches may be from other communities. Travel is typically less than one hour, playing communities such as Twinsburg, Solon, Aurora, Revere, South Euclid, Cleveland Heights, Bedford, and Kenston. Each year typically brings out different community teams. 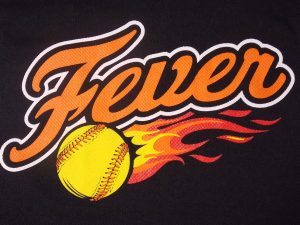 Players already rostered on NSA, ASA, or USSSA weekend tournament teams will not be permitted to participate on the Ohio Fever. Fees include: indoor training sessions, participation in a winter league (Pinnacle or Spano Dome), Western Reserve Fastpitch League/Field/Umpire fees, as well as tournaments. Q – Are Fever team’s weekend tournament only teams? A – Generally no, however at the older levels (U16 – U18), that will depend on the division of play and on the coach’s preference. Q – Do you have to try-out for the Ohio Fever? A – Yes. Try-outs will be held mid-July through early August. Check our web site early July for more information. Q – Does it cost anything to try out? Q – How many girls are on a team? A – This number will vary from team to team. However, each team may carry a roster of 10-12 girls. Q – What division should my daughter tryout for? Q – Is each girl guaranteed playing time? A – No. Travel softball is very different from recreational softball. Competition is elevated, and coaches will play girls based on many factors such as: Attitude, softball ability, hustle, and being coachable. Q – How much does it cost to be on a Fever team? A – The cost may depend on several factors such as: Sponsorships, fundraising, the number of tournaments the team plays in, amount of winter activity (winter games/practices), and uniform prices. Fees for 12U and 14U typically start around $450 per player plus uniform costs. 16U and 18U fees are in the range of $500 – $700 per player plus uniform costs. Q – How long does the season last? A – This will vary from team to team. Winter training usually starts in February. The outdoor season usually starts in May and ends in July. Q – Can my daughter play on another team at the same time as being on a Fever softball team? A – No. It is a large commitment to play travel softball, and each team relies upon each player to be at every game/practice.